While I would love to say that I slaved over a hot grill while cooking the chicken, or that I nearly lost a finger while slicing up the fennel and grating the Parmigiano Reggiano, the truth is that this was a really easy meal to pull together (it helps that Mrs. G-LO planned ahead and picked up the chicken and fennel the day before at Trader Joe’s). This meal was so easy that I even had enough time to do a bit of beertography and write up a quick review of the Two Brothers SideKick Extra Pale Ale while the chicken was cooking slowly on the grill. Buddy, pal, mate, brother (or sister) from another mother, compadre…Sidekick. All of these are ways to describe someone or something that is always at your side. Sidekick extra pale ale is one of those things. This golden colored ale is loaded with juicy citrus and passion fruit hop aroma yet balanced with malty and hop character. A true companion. Appearance: Golden yellow with a slight orange tint. Minimal head and just a smidgen of lacing. Aroma: Lightly hopped with a hint of orange zest as well as some herbal notes, i.e. rosemary and thyme. A bit of biscuity sweet malts playing background. Taste: Medium carbonation with a light mouthfeel. A touch of hoppy bitterness at the onset followed immediately by those sweet malt notes. Very crisp, clean, and refreshing at the finish which makes you want to keep going back for more. The herbal notes show up in the aftertaste. 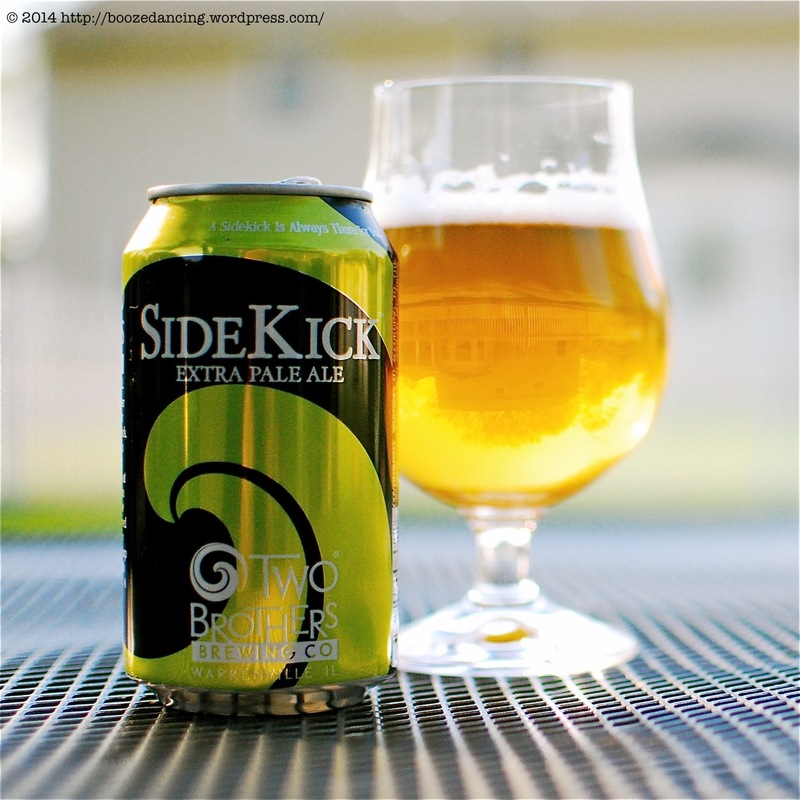 I am happy to report that Two Brothers SideKick is a truly delicious and easy drinking beer. This is not one of those weird or overly complex beers that are all the rage these days (I’m looking at you Dock Street Walker! And you too Rocky Mountain Oyster Stout! And Indra Kunindra, I haven’t forgotten about you either.). What we have here is a beautifully crafted beer that was great on its own, and one that would have been super tasty alongside our Saturday night dinner. I highly recommend it and will definitely seek it out again. Bravo Two Brothers! Sounds like the way I feel about Twin Lakes Pale Ale. Nothing over the top, drinkable, goes great with food. Don’t think I’ve had the Twin Lakes. Shall seek it out. Sounds like a beer that needs to be kept on hand. I’m still having some difficulty getting over the shaved asbestos on that plate of horrors. How did you eat it with those masks? Long ago and not so far away I had a bit of another Two Brothers brew – but pairing it (or almost any beer) with Han Dynasty’s decidedly fiery, “Wewease The Kwacken”-like cuisine was a mistake. Simpler, well-crafted brews are finding their way into my research chilling station more and more often. Sounds as though I might need to make room for one of these. I recall this Han experience. Wasn’t that the night when you lost the Man vs Food bet?